Welcome to Celine's Ami-Chan no Hatsukoi Page! Probably the only one of its kind. Hey! Hey! A rival has appeared for that studious Ami. Who is this person that contiously ranks first...on the "National Exams" alongside Ami? With the appearance of this rival...Ami has become passionate, as if she was in love! She's studying awfully hard for the exams! Perhaps, this is Ami's first love! At last, we found out who he is! 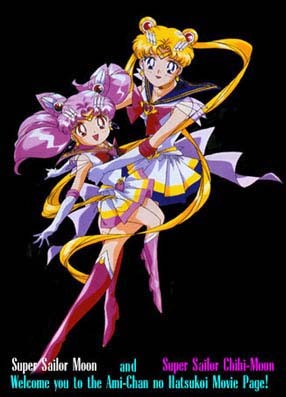 But to tell or not to tell... A special presentation of Sailor Moon SuperS plus, Ami's First Love! This is basically what the movie, which aired sometime suring the fourth season of Bishoujo Senshi Sailor Moon SuperS, is about. I know what you're thinking.Why make such a page? Well, I really enjoyed the Ami-Chan no Hatsukoi Special and I decided to make a neat page on it. And for the large graphics on my page, well, a good page has good graphics, albeit mine are not too big. My page is basically a rip-off of my friend Mog's site (Bishoujo Senshi Sailor Moon) over at GeoCities (eeww~!) and basically he did most of the work of getting me started, but I did the HTML and uploaded everything on the pages. And (if you're thinking) why Sailor Mercury? Alright, this is WAY old. 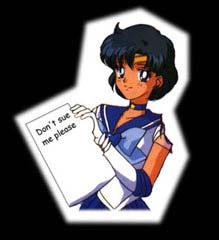 Sailor Mercury is one of the senshi too; everyone has their own opinions. Besides...we personify her from what originated as a drawing (as we did the other SM characters) and if you're going to diss on her, diss on the other senshi too. They're no where near real representations of humans although we value or envy such qualities much noticed bestowed in them.Go ahead-- flame my guestbook if you want. I will only respond to intelligent attacks. On this page you can simply download several forms of the movie, read about it, find out a little about Ami-Chan, enjoy the funky beats to the movie, and that's basically about all. I would first like to thank MoG for setting me up to do this page, and he would like to thank VKLL and Doug Price for countless reasons--he says this page wouldn't be here right now if not for them. Summary This page has an in-depth description of the Ami-Chan no Hatsukoi Movie. Trust me, it's complete. Nine segments (based on the ami#.avi's) of information and around 250 pictures. Took me a while to complete. Music This page contains the music and lyrics to the songs played in the Ami-Chan no Hatsukoi Movie. Profile Ami's profile, linked directly to Mog's Sailor Mercury Profile Page. (What? You think I'd actually make my own? When it's just there for you to take?!) Okay, maybe I will make my own, when I have the time. Just don't look forward to it too soon. Another way of saying welcome. Sailor Moon is �1992-1997 by Naoko Takeuchi, Kodansha, Bandai, Toei Animation, and other others associated. The English Adaption is �1995 by DiC. Well, my page is not for profit use, and exploits nothing of the nature, so I simply put it to you lawyers and law-know-it-alls: Don't sue me! Thanks, enjoy my site =P.